Although studies on policy transfer have expanded, a general and comprehensive understanding of policy transfer is lacking. 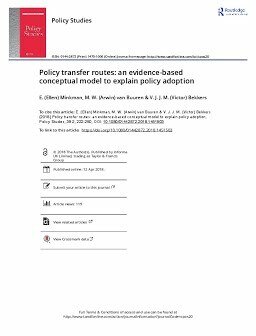 This study offers an evidence-based explanation of policy transfer processes. We extracted constraining and facilitating factors from 180 empirical studies using PRISMA (Preferred Reporting Items for Systematic reviews and Meta-Analysis) and aggregated these factors into a conceptual framework. We synthesize our findings in four “transfer routes”. We conclude that actors could shape a subset of those factors by taking certain decisions regarding transferability, adoptability and process design, albeit within the boundaries of the environment.